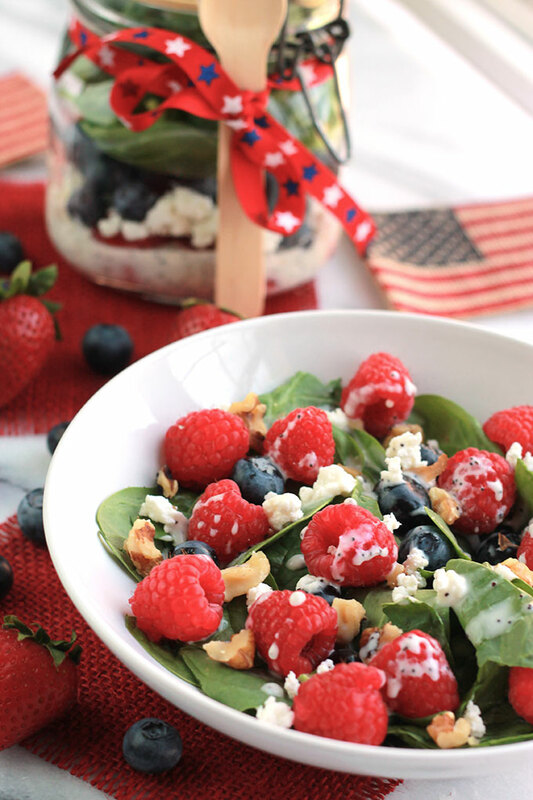 Layers of fruit, creamy goat cheese and lettuce, this Red White & Blue Salad with Poppy Seed Dressing is colorful and perfect for patriotic celebrations. I made this for Memorial Day and it was a big hit, everyone loved it. 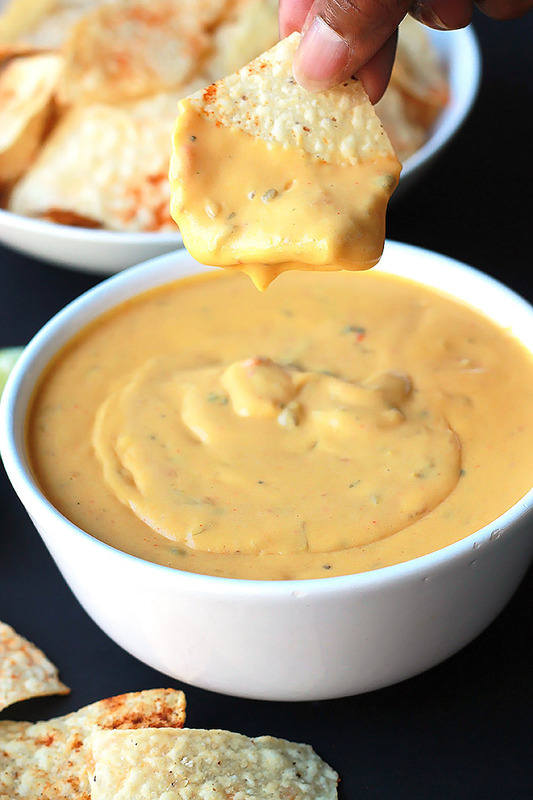 a mixture containing a specified ingredient served with a dressing. a vegetable suitable for eating raw. I’m a big salad eater and my salads aren’t always big bowls of veggies. 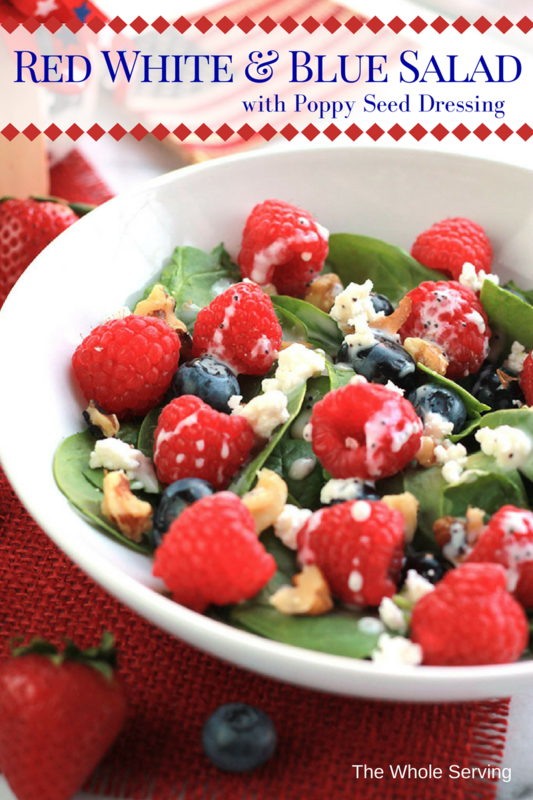 I love adding sweet or tart berries to greens for a salad that’s extraordinary with remarkable flavor. It’s like magic in the mouth when the sweet juicy fruit mixes with the creaminess of the cheese and earthiness of the greens. And oh by the way this Poppy Seed Dressing is awesome. 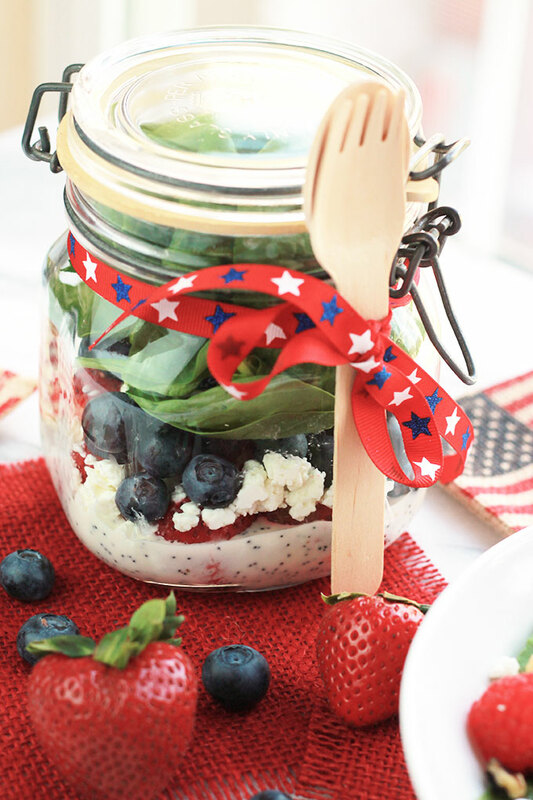 This Red White & Blue Salad with Poppy Seed Dressing can be easily made ahead in jars and served individually at summer gatherings. 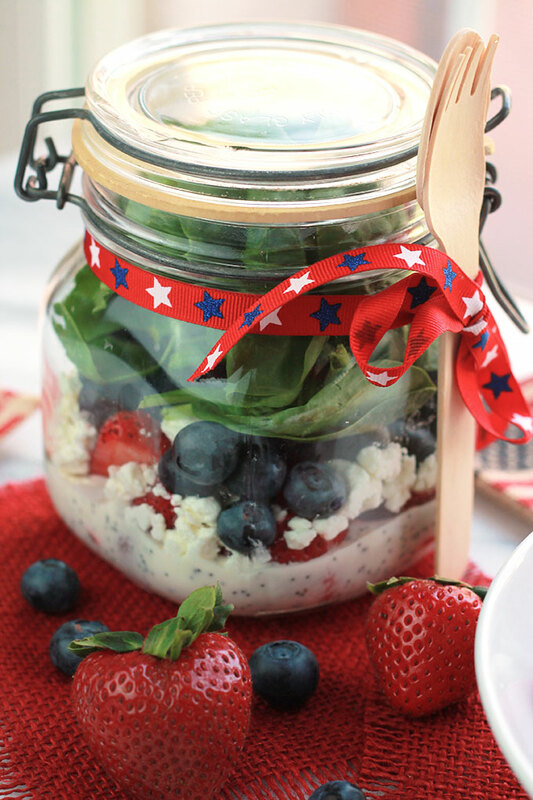 Simply fill the bottom of each jar with dressing, add the berries, goat cheese and top if off with the greens. When it’s time to eat, give it a shake to dress the salad and enjoy! To assemble salad in jars, start by pouring 2 tablespoons of dressing into bottom of jar. 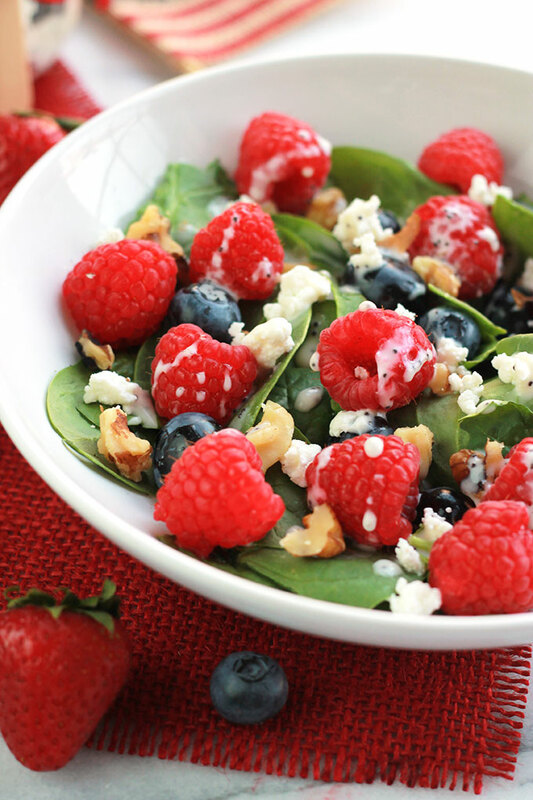 Add 1/2 cup of strawberries,1/4 cup cheese, 1/4 cup blueberries, 1 cup lettuce and top with 1 tablespoon nuts. When ready to serve, give jars a big shake to toss dressing with salad. Eat straight from the jar of dump into a bowl and enjoy! VARIATIONS: TRADE WATERMELON CUBES OR RASPBERRIES FOR STRAWBERRIES AND FETA FOR GOAT CHEESE. 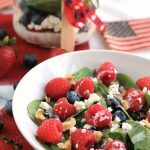 If you make this recipe take a picture and tag @thewholeserving on Instagram and hashtag it #thewholeserving, I want to see your version of Red White & Blue Salad with Poppy Seed Dressing. This is a perfect festive salad, Celeste. 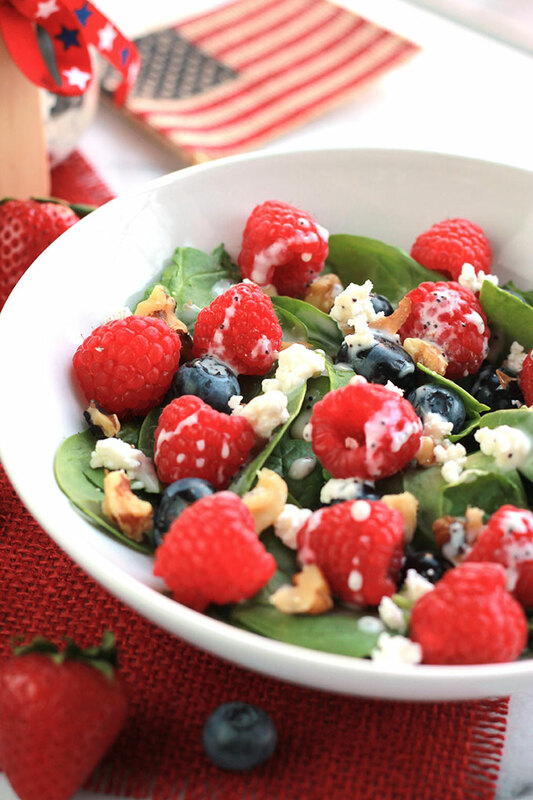 Adding fresh berries to anything makes me a happy girl, and the addition of creamy goat cheese really puts this one over the top. Thanks Mary, you are so right the creamy texture of the goat cheese is perfect. Wow! This looks so delicious . I will be making this tomorrow! Thank you. Thanks for stopping by Sam. Enjoy! !